From March 30th to April 1st 2018, the National U19 teams of Belgium, Brazil, Catalonia, Czech Republic, England, Germany, Hungary, Netherlands, New Zealand, Poland and Portugal will face each other at the IKF U19 Open European Korfball Championship 2018 in Friesland, The Netherlands. (Venue: Kalverdijkje Sporthal, Leeuwarden). Update 21 March 2018: The team from Turkey withdrew from the IKF U19 OEKC. Due to this late withdrawal the pools and the match schedule have been adjusted. This year’s U19 tournament is a special one, while for the first time ever this long existent event has got an official IKF status. The IKF U19 Open European Korfball Championship 2018 is ready to start in Leeuwarden! 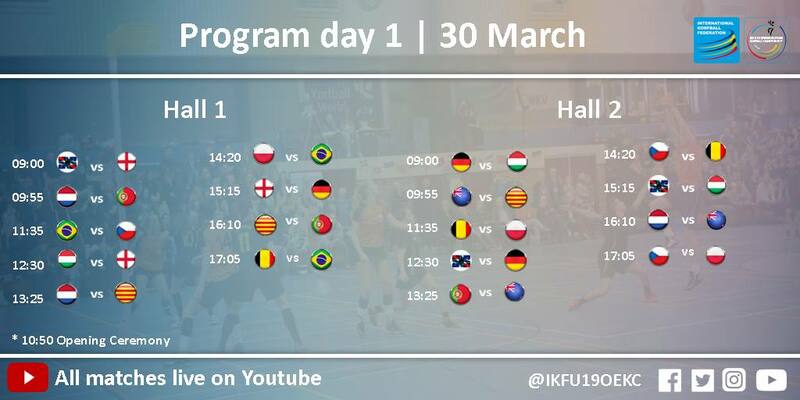 From March 30th to April 1st 2018, the National U19 teams of Belgium, Brazil, Catalonia, Czech Republic, England, Germany, Hungary, Netherlands, New Zealand, Poland, Portugal and Netherlands RTC North will face each other at the IKF U19 Open European Korfball Championship 2018 in Friesland, The Netherlands. The venue: Kalverdijkje Sporthal, Leeuwarden. All information, pools, tournament rules and matches schedule are available on ikf.org/event/ikf-u19-open-european-korfball-championship. In a little under two months the 30, 31 March and 1 of April the National U19 teams of Belgium, Brazil, Catalonia, Czech Republic, England, Germany, Hungary, Netherlands, New Zealand, Poland, Portugal and Turkey will face each other at the IKF U19 Open European Korfball Championship 2018 in Friesland, The Netherlands. This year’s U19 tournament is a special one, while for the first time ever this long existent event has got an official IKF status. In 1996 the former district of the Royal Dutch Korfball Association (KNKV), Friesland, organised an inaugural tournament for U19 players from countries all over the world. The tournament was the idea of the late Jan Hanekroot who was then the IKF Development Officer for England. The first edition involved five countries and was very successful and since then the Junior World Cup, later converted into Korfball World Cup, has grown throughout the years in quantity and quality. A great achievement! The Netherlands’ representation in the tournament began with a regional Frisian team and was followed in subsequent years by the Junior Talent Team from District North, now named The Netherlands RTC North. Since 2008, the national under 19 squad has been participating in the tournament. In this year’s edition The Netherlands RTC North will complete the participants of the event for the last time. Starting with 2019 only National teams of countries will be allowed to participate. From now on the former IKF patronaged U19 Korfball World Cup will continue as a biannual IKF U19 (Open) European Korfball Championship altered with a biannual IKF U19 World Korfball Championship. This automatically means that in the future the IKF U19 events are open for bidding for all IKF member countries. Nevertheless, the first IKF U19 World Korfball Championship in 2019 already has been allocated to the Dutch Royal Korfball Federation (KNKV). The 13 teams of the 2018 edition are divided into three pools. On the first day of the tournament most of the pool matches will be played. The remaining pool matches will be played on the first part of the second day. Later that day the 8 highest placed countries will play the quarter- and semi-finals. While the 5 lowest ranked teams will continue their tournament in a new pool. On the third and last day the final classification will be decided and will it become clear who can call themselves IKF U19 Open European Korfball champions of 2018. Each match (except the final day) will last two times 15 minutes real playing time with a 4-minute halftime break. If there’s no winner after regular playing time, a golden goal period of 5 minutes will decide who comes out as winner. Would you like to see the korfball talents of each country live? Visit the event during the Easter weekend at ‘t Kalverdijkje in Leeuwarden, The Netherlands. The first match is scheduled to start at 9:00 AM on the 30th of March. The final match is scheduled to start at 2:45 PM on the 1st of April, after which the medal ceremony will start at 4:00 PM. More info, pools & playing schedule you can find at: www.ikf.org/event/ikf-u19-open-european-korfball-championship.